This month the OneNote team is pleased to release new capabilities to enhance inking, clipping content from the web and working with others. We have a lot of great things to share with you, so let’s dive right in. Ink effects—Sometimes a simple color isn’t enough to get your idea across. Now you can jazz up your notes and drawings with new ink effects like rainbow, galaxy, gold and silver to make anything you write more unique and even more fun. We were inspired to create these new ink effects in response to requests we heard from students when we visited their classrooms. During beta testing, we were pleased to see the smiles brought to everyone’s faces—young and old alike. Ink effects are now available for Office 365 subscribers in OneNote on Windows 10. Inking in OneNote for Mac—Today, we’re launching ink in OneNote for Mac for the first time, bringing to life one of our top user requests. Now you can write, draw and highlight with tools on the new Draw tab using your mouse or trackpad. You can also use your third-party drawing tablet or display that uses a pen or stylus to write, draw and erase –just like pen and paper. And we’ve added lined pages and grids as a background option to help keep your new handwriting and drawings neat and tidy. If you’re a big fan of drawing and writing with ink, OneNote works great with the iPad Pro and Apple Pencil as well. 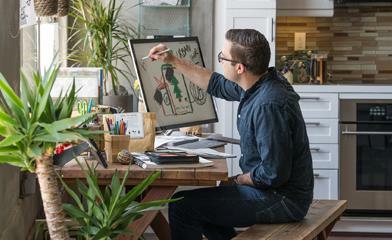 These new tools for Mac let you express yourself in a whole new way, as you think with ink. Get OneNote for Mac in the Mac app store today. 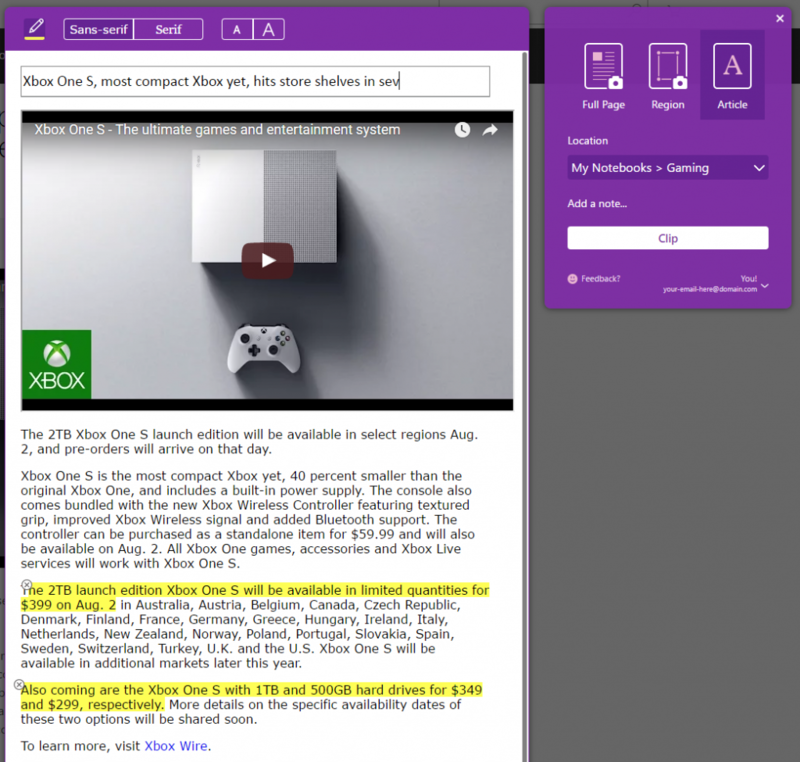 Our OneNote Web Clipper is better than ever. We have a number of new features on our Web Clipper for Chrome, Safari, and IE to give you more control over your screen clippings before you send it into OneNote. Preview—Ever wonder exactly what was about to show up in OneNote once you clipped? Problem solved! Now all clipping modes—full page, region, article, recipe and product—provide a preview so what you see is what you get. YouTube and Vimeo support—You can now clip videos from YouTube and Vimeo pages into OneNote. Highlight text—When you clip an article, product or recipe you can highlight sections of text, and those highlights will be saved to OneNote. Clip multiple regions in one go—Clip multiple regions of a webpage and save them all in a single OneNote page. Use your own title—Change the title of your page in the preview window before sending it to OneNote. Articles your way—Change the font size and type in your article to improve readability before you even clip it to OneNote. Update to the latest version to see all the new features or download the extension at www.onenote.com/clipper. Never miss an important notebook edit again. 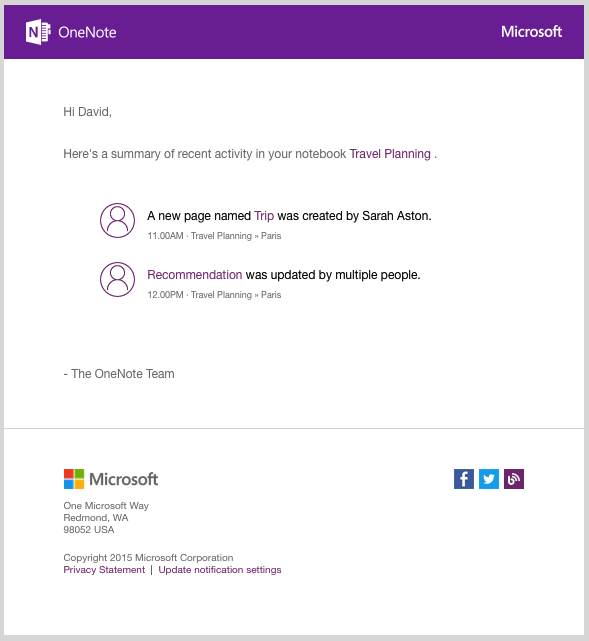 For consumers using a Microsoft account, our newly improved sharing notifications means you’ll receive an email letting you know that someone has made a change to your shared OneNote notebook—helping you stay on the same page. Users now will receive a maximum of five emails a day from the Sharing Notification Email service. Each email includes changes from all of your notebooks. The cadence of emails may change as we continue to improve our services. To manage your notification settings, visit www.onenote.com/sharenotificationsettings. It’s been a big month here at OneNote, thanks for taking the time to read up on everything new you can do. One last thing, in the next few weeks, we’ll launch our new OneNote importer tool for Mac to help even more people import with confidence. We always want to hear your feedback, so make comments below or follow these links.